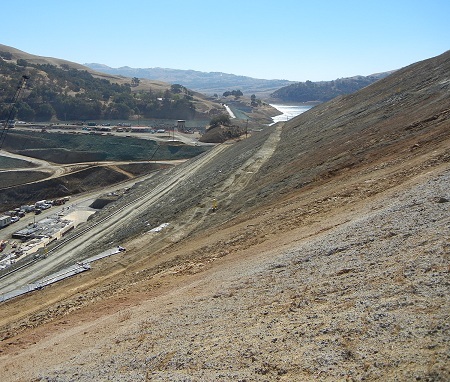 The other day I took a field trip to see the construction site of the new dam for the Calaveras Reservoir. (The old dam is being replaced because it’s not strong enough to endure a big earthquake on the Calaveras fault, which runs essentially right through it.) It was a cool time, with fossils and big construction vehicles and engineers and grout. As the dam people were orienting us that morning, they passed around specimens of the major rock types in the area, and here was a fine chunk of chert from the Claremont Formation. What the heck, I’m not planning to publish these anywhere else: here’s a cobble from a conglomerate down there that’s been stretched and fractured by activity on the Calaveras fault. It was exactly like the examples in our own Oakland Conglomerate. 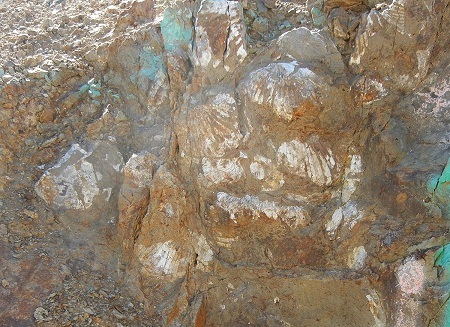 I think this one was from the Berryessa Formation (which is also found up at Alum Rock). Considering the looseness of the definitions of these formations, I feel safe in correlating them, although Crittenden defined the Berryessa as lying above the Oakland. Anyway, the phenomenon is the same. One major feature of the construction project is an enormous cut made into the hill on the west side of the dam site. Basically, they discovered an active landslide there and decided to excavate the whole damn thing. We got to wander out along this exposure and hunt for fossils in the Temblor Formation, or at least rocks mapped as the Temblor. There were a fair number of big ol’ scallop shells to be found, usually in pieces. 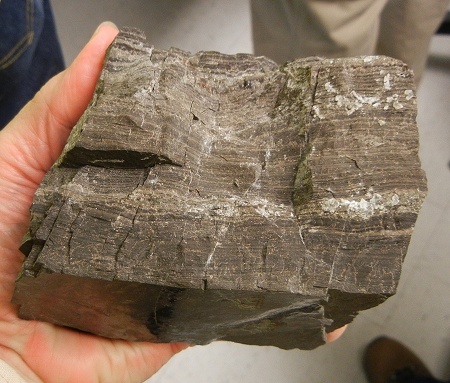 Also some coaly bits of fossil wood. This is a rare exposure of an actual bedding plane, as marked by a pavement of scallop shells in what looks like their growth position. We also learned a lot about the recent project that rebuilt part of the Hetch Hetchy Aqueduct that runs through here. 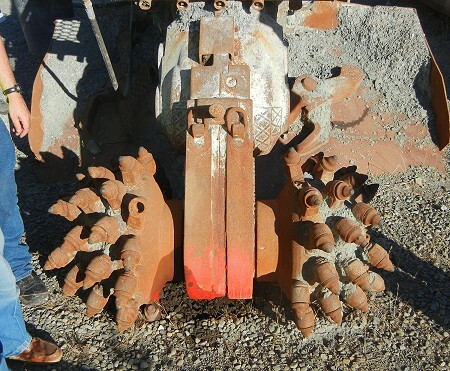 Once the work was done, this tunnel-digging machine became surplus. The guy asked us if we wanted to bid on it. I thought it had the makings of a good Burning Man stunt. This entry was posted on 16 November 2014 at 9:15 pm and is filed under Oakland chert, Oakland conglomerate, Other topics. You can follow any responses to this entry through the RSS 2.0 feed. You can skip to the end and leave a response. Pinging is currently not allowed. I work with a group of Environmental Volunteer Science Docents on the Peninsula. Would love to organize an enrichment field trip to the dam site for the docents. Do you have a contact? My neighborhood group in an impacted area got an excellent tour of the dam site in August of 2012, complete with air showers for naturally occurring asbestos that may occur onsite. I believe we contacted Maria Le. 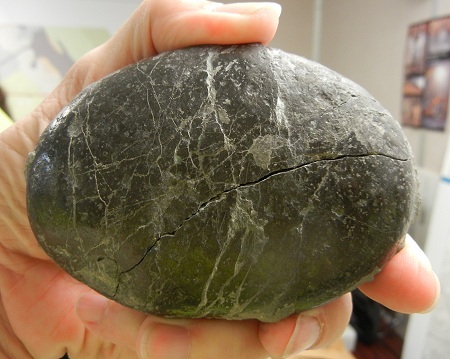 The site geologist’s office was open, and it was full of eye-popping wonders from the site. We were shuttled around the site by knowledgeable and interested people who were able to answer questions in detail.